Paul Brown Mediation | A Safe Place For Difficult Conversations • Serving Peterborough, Northumberland County, Hastings County, and the GTA since 2009. A Safe Place For Difficult Conversations • Serving Peterborough, Northumberland County, Hastings County, and the GTA since 2009. PAUL BROWN MEDIATION was established in 2009 by you guessed it, Paul Brown, with a vision of helping people through challenging times and difficult transitions in their lives. At that time, Paul was working in Child Welfare as a Child Protection Worker, and felt that he would be more effective at helping families move forward with their lives as a Family Mediator. Paul recognized early in his “helping” career that by engaging people in their own decision-making, more sustainable change was developed. By becoming a mediator and then coaching other mediators, Paul has been able to help hundreds of families create better long-term outcomes for themselves, and more importantly, for their children. 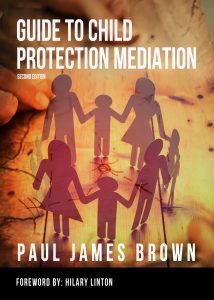 Guide To Child Protection Mediation: Second Edition AVAILABLE NOW!!!! Check the Resources page to orders your today! February 21, 2019 – Paul posted a new article titled “Conflict Quicksand.” Check out the Resources page to read it. Savannah and Tori are now accepting Family Mediation referrals as a team at a discounted rate. Check out their bio pages and contact them directly. Paul is in the process of editing his next book; “Family Mediation: A Guide for Parents.” Keep checking back for updates on when it will be published. March 4, 2019 – Paul was a Guest Speaker and Coach at Riverdale Mediation as part of their “Basic Family Mediation Theory & Skills” course. He presented on tips for effective mediation. September 14, 2018 – Paul was a Guest Speaker at Riverdale Mediation as part of their “Advanced Family Mediation: Theory & Skills” course. May 10, 2018 – Paul was a Guest Speaker at Riverdale Mediation as part of their “Basic Family Mediation Theory & Skills” course. He spoke about the differences and similarities between Family Mediation, and Child Protection Mediation, as well as Addictions in Mediation. May 3rd – Paul presented on “Child Protection Mediation: More Than Meets The Eye” at the FDRIO unConference in Toronto, ON. Focus was on the diverse areas in which CP Med can be utilized outside of the Custody & Access referrals typically seen. May 1st & 2nd – Paul presented on “Child Protection Mediation Review for Front-Line Staff” at the bi-annual Provincial ADR Advisory Committee Symposium in Toronto, ON. Presentation was a review of process from CAS file opening to mediation file closure, highlighting the new CYFSA (proclaimed April 30, 2018), consent, and balancing power in CP Med.